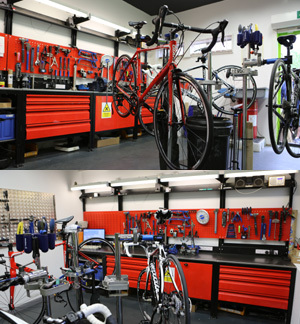 Pedal On has a state of the art workshop offering servicing for all types of bikes and with specialist equipment to undertake mosts jobs on modern bicycles. We carry a massive range of parts and specialise in the servicing of Giant, Scott, Trek and Cannondale bicycles. All our mechanics are Cytech qualified and offer work of the highest standard. Workshop jobs are by appointment only, please call 0118 9821 021 (option 2) for pricing and availability. Our workshop offers booking Monday to Friday 9 to 5. Please Note: The demand on our workshop is seasonal and during the summer we may be booked up 3 weeks in advance. Please book early to avoid dissapointment. Pedal On's workshop can fault diagnose and customise the setup of your Shimano Di2 gears (excluding Dura Ace 7900).